Sturgeon Bay, Wisconsin is the birthplace of the S.S. Badger, the last coal-fired steam powered passenger ship still sailing Lake Michigan. Built in 1951 by the Christy Corporation, the Badger was commissioned by the Chesapeake and Ohio railroad company at a cost of five million dollars. It was named in honor of the mascot at the University of Wisconsin and was the second ship launched in 1952, after the S.S. Spartan. Mrs. Walter J. Kohler, Jr., wife of the Wisconsin governor, christened the Badger on September 6, 1952. Captain Bernard Robertson was named as the master of the new trainferry. Primarily built to carry railroad cars across the lake, the Badger was considered a trainferry, rather than a carferry. The Badger's maiden voyage to Ludington, Michigan took place on March 21, 1953, carrying paper from the Wisconsin Paper group. It was the largest carferry ever built, capable of traveling a maximum speed of 24 mph. In the earlier years, the carferries traveled year 'round between Wisconsin and Michigan, battling the high waves and ice. But both steam ships had trouble with winter ice in February of 1963, and the Badger was docked due to a coal strike late in 1971. The Badger had one Michigan port--Ludington--but three Wisconsin ports--Manitowoc, Milwaukee, and Kewaunee. It left Milwaukee for the last time on October 24, 1980, ending service at that time, but under an MDOT subsidy, resumed its travel to Milwaukee in June of 1981. With the railroad freight business dwindling, it looked as if the carferries were headed for the scrapyard. C&O dropped both the Milwaukee and Manitowoc runs, and even offered to give the boats away. Finally in 1983, in order to save the ships, Glen Bowden and a group of Ludington businessmen bought all three carferries--the Badger, Spartan and City of Midland--for one dollar each. Their new company, called the MWT (Michigan-Wisconsin Transportation), struggled to keep the ships going, but in 1990 the carferries were permanently docked, with the fear they would never sail again. It was a sad time for the area...where at one time, nine carferries sat in port. In yet another heroic move, Holland, Michigan resident Charles Conrad purchased all three ships in 1991 and renamed the company Lake Michigan Carferry. Service was established between Ludington and Manitowoc for the S.S. Badger, which was rededicated in 1992 as a non-railroad carferry. Mr. Conrad invested $1.5 million into the Badger, readying her for passenger cruise service during the summer months. They had hoped for 80,000 passengers that first season, but ended up with 115,000, and it's been smooth sailing since. 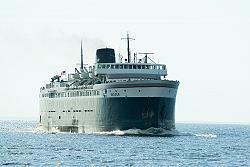 The 410' S.S. Badger is the largest carferry to sail the Great Lakes, and can carry 620 passengers and 180 autos. It travels at roughly 18 mph to make the four-hour trip, with nearly 490 crossings per year. On board are 40 staterooms, outside deck, snack bar, video arcade, gift shop, TV and movie lounges, and children's playroom. 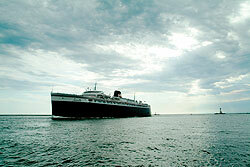 In 1997, the Badger was officially named a Registered Wisconsin Historic Site, and in 2002, was named Ship of the Year by the Steamship Historical Society of America. In 2009, the Badger was placed on the National Register of Historic Places by the U.S. Department of Interior. And in 2016, the S.S. Badger finally gained its status as a National Historic Landmark...almost five years after Lake Michigan Carferry's initial application. It started with the Ann Arbor I in the early 1900s--and 13 carferries later--the S.S. Badger still sails from Ludington, Michigan to Manitowoc, Wisconsin from mid-May to mid-October. It is as symbolic to Ludington as our lighthouses, and a beloved sight to watch.